I swear. This is the fourth time that I’ve ripped them out. This time, it was because I didn’t have the right size. Apparently, my father has extra-large, extra-wide feet… According to this pattern anyway. I am beyond frustration, but these socks will be finished. They are coming with me this weekend, and I’ll finally get them going properly. No more ripping out, no more re-casting on. I don’t know if I’ve ever done this much frogging on something so small and simple. I guess there’s a first time for everything! I’ll be glad when they are finished and I can start something else. Now, back to packing. I thought I had everything in the two bags I brought, but it turns out that I forgot to throw in the knitting. I don’t know where I’m going to put it, but I’ll find a place. I’m sure of it. I probably won’t be able to post until Tuesday, so until then, enjoy the weekend. For all of my Canadian readers, happy Thanksgiving! Sometimes, things don’t go as planned. Like socks, for instance. Those socks are out to get me. I swear. This morning, after finishing some of the cable section of the leg, I realized that using self-striping yarn for cabled socks isn’t too intelligent. I couldn’t see the cables at all. The sock pattern is really beautiful, and I didn’t want it to go to waste. So what’s a girl to do? The only thing she could in a situation like this. We had a breakup. I ripped them back, completely and utterly. I’m planning to use that pattern for some yarn that I have for my brother for Christmas. I re-wound the yarn and did a little gauge, and I’m planning to cast on for some vanilla socks for this wonderful yarn. I hope my dad doesn’t mind. Somehow, I don’t think he’ll notice too much. In other news, movies and sweater-knitting nights are my favourite. There it is (although apparently it turned out blurry). I’ve got 9 inches done so far! 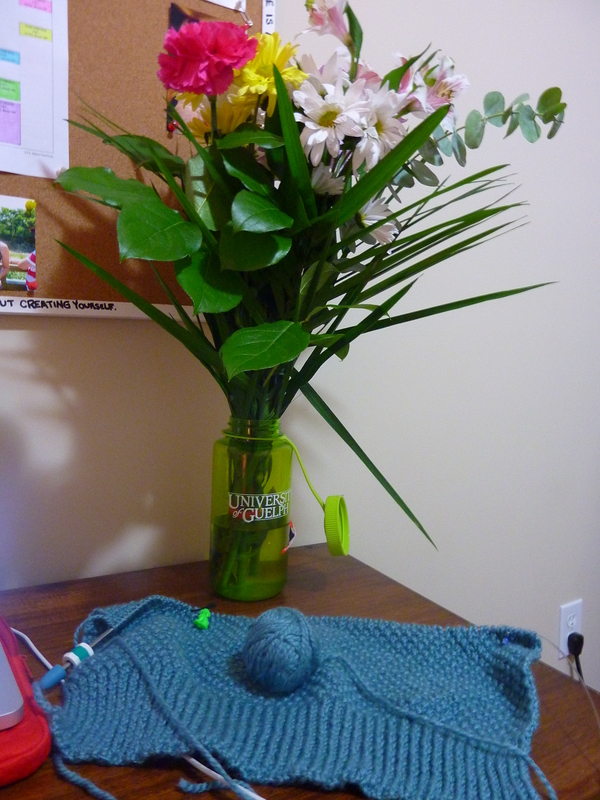 I love working with the yarn… It’s my favourite kind for a reason. It’s squishy and warm. I can’t wait for this thing to be a sweater. The pattern is just mindless enough for me to get really into a movie and yet still stay awake. As a result, I’m totally undecided as to what to bring home this weekend in terms of knitting. It’s Thanksgiving weekend here in Canada, which means a long weekend. I’m actually going to Toronto to compete at the National level with Pony Club. I’m excited, though not as excited as last year. That was my first year and we travelled to Calgary. I got to go to Spruce Meadows, and it was definitely a very cool experience. This year it’s a little closer to home, but I’m sure it will be a lot of fun. I’ll be heading home for Monday and most of Tuesday. I’m glad – I miss my family and of course my horses. Now. If you’ll excuse me, I have to go and do some studying for Nationals this weekend. There may be knitting. But most of all, there will be the smell of flowers. Flowers from my boyfriend, just because. He’s the best. It’s happened quite a few times in the past 24 hours… That sinking feeling. First, last night, upon realizing that I have a horse show on Saturday, and I don’t have boots or a show coat (crisis averted, they arrived this morning). Then, again last night, upon realizing that I skipped a good 14 rows of a chart. How exactly does one do this? Perhaps by knitting in the semi-dark. Also through my inherent inability to read and follow a pattern. 14 rows is a lot of rows. And I absolutely hate frogging, but sometimes you have to. Namely when you’ve already done the first two heel flap rows. I did manage to recover from last night’s fiasco with the chart. 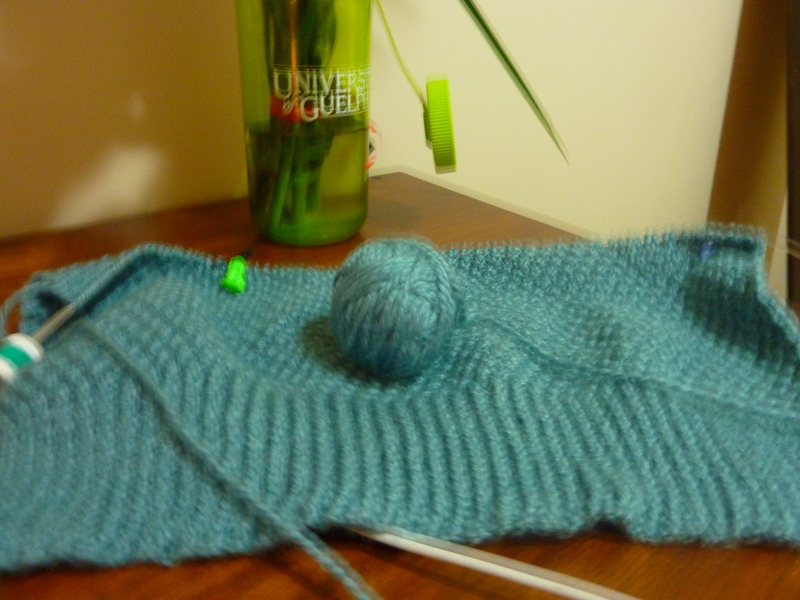 The SIP is now only 4 rows away from starting the heel flap (for real this time, I swear). It looks pretty good too. This morning I figured that I would stop at my local (sort-of) yarn shop on the way to work. We don’t really have dedicated yarn shops where I’m from, since I live in the middle of nowhere, but we do have a few stores that sell yarn. I dropped into one this morning, only to find that it didn’t open until 10 (I started work at 10). Joy. Back to the drawing board on that one, looks like I’m going to have to wait until tomorrow until I can get my yarn fix. I haven’t been yarn shopping in over a year. What is wrong with me? I am extremely cheap and on a student’s budget to boot. There’s tons of leftovers in my yarn bin(s) that I’ve been working on using up. It has been fulfilling my yarn cravings, but sometimes a girl needs new yarn for a specific project. Since the store is closed, I’ve been drooling over yarn online. I’ll be right back as soon as I finish staring at this hand painted sock stuff that goes for $28/skein + shipping……..